Purple Caper - Wedding Cake. Free US delivery. Purple Caper Seeds has claimed that this pheno of Wedding Cake has the best flavor of all the cookies. Also very fragrant and sticky means that these regular cannabis seeds are great for breeders or hobby collectors. Wedding Cake is known for is large yields and great production levels. 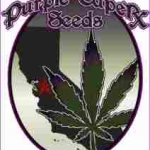 Wedding Cake by Purple Caper Seeds will make an excellent seed for collectors interested in preserving the genetics of the Girl Scout Cookie lineage.